The first change in the top leadership position in the history of Bishop Simon Bruté College Seminary in Indianapolis has been announced by Archbishop Joseph W. Tobin. Beginning in July, the archdiocesan-sponsored seminary will be led by a new rector, Father Joseph Moriarty, who has served as its vice rector for the past three years. He will succeed Father Robert Robeson, who has served as Bishop Bruté’s rector since it was founded in 2004. 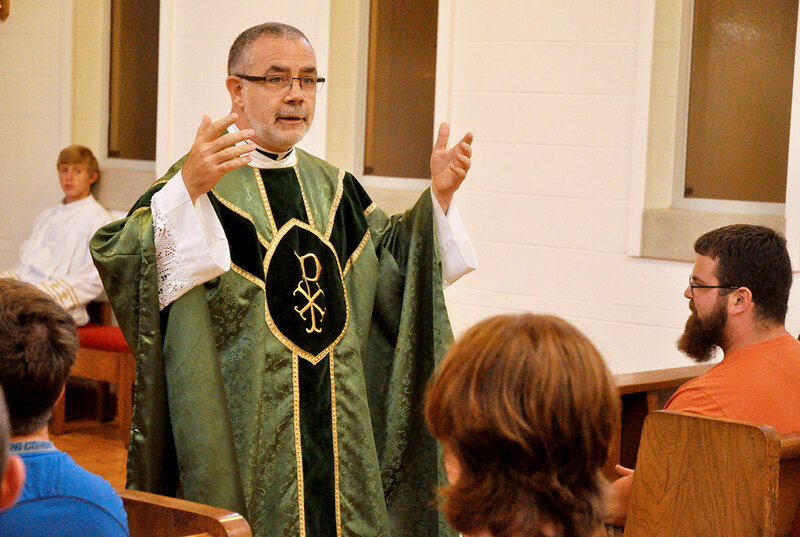 Father Robeson has been appointed pastor of Most Holy Name of Jesus Parish in Beech Grove effective on Aug. 1. Benedictine Father Justin DuVall, who retired on June 2 as archabbot of Saint Meinrad Archabbey in St. Meinrad, will serve as Bishop Bruté’s vice rector. “For more than a decade, Father Bob Roberson has given every ounce of his intelligence and energy to make the inspiration of Archbishop Daniel [M. Buechlein] a first-class house of formation,” said Archbishop Tobin. He also expressed confidence that the good work begun by Father Robeson will continue at the seminary under its new leaders. Bishop Bruté began with six seminarians on part of a wing of a dormitory on the campus of Marian University in Indianapolis, where seminarians still take classes. In 2008, the seminary relocated to the former Carmelite Monastery of the Resurrection one mile south of Marian when the nuns who lived there moved to the motherhouse of the Congregation of the Sisters of the Third Order of St. Francis in Oldenburg. They sold the monastery to the archdiocese for use as the home of the seminary. Father Moriarty brings to his new ministry nearly 20 years of involvement in priestly formation. He served as archdiocesan vocations director from 1998-2005. He then served on the spiritual formation staff of Saint Meinrad Seminary and School of Theology in St. Meinrad before becoming Bishop Bruté’s vice rector. None of this was what Father Moriarty planned for himself when he was ordained in 1993. It started when Msgr. William F. Stumpf, then serving as archdiocesan vicar for clergy, called him in 1998 to ask him to serve as vocations director. Now he is looking forward to following in the footsteps of Father Robeson in forming future priests at Bishop Bruté. Father Moriarty will collaborate closely in this ministry with Father Justin, who served as vice rector at Saint Meinrad from 1996-2004 before being elected archabbot. He served as vice rector at Saint Meinrad when Father Robeson was a seminarian, and looks forward to continuing the good leadership that Father Robeson gave to Bishop Bruté over its first 12 years. At this point, the future of Bishop Bruté seminary is bright. Father Justin and Father Moriarty expect to welcome 51 seminarians from 10 dioceses and one religious order when the next academic year begins in August—an all-time high enrollment for the seminary. Bishop Bruté will not take more than 51 seminarians because Archbishop Buechlein, who founded the seminary, intended it from the start to be a close-knit community of young men being formed for the priesthood. Father Robeson said that the optimal size for this community life to flourish is between 30 and 50 seminarians. This allows the formation staff, who live with the seminarians, to get to know them well. This, he said, has in turn led Bishop Bruté to be seen as a “model seminary” by bishops and priests throughout the Midwest in its relatively short history. “The bishops know that we know their guys,” Father Robeson said. “We know what’s going on in their families, what their weaknesses are and what their gifts are. We’re able to speak articulately about that with each guy. They know that we spend time with them. Archbishop Tobin confirmed that bishops of other dioceses that send seminarians to Bishop Bruté approve of the priestly formation that happens there. Father Moriarty is confident that he, Father Justin and the other members of the formation staff will carry on Father Robeson’s legacy at Bishop Bruté. “It began as a house of formation and although it’s become a college seminary, it hasn’t lost its successful closeness of being a house,” Father Moriarty said. “And of course, like any family, we may not always get along. But, in the end, we have to recognize that this is my brother and I care about him. Father Bob has led that.